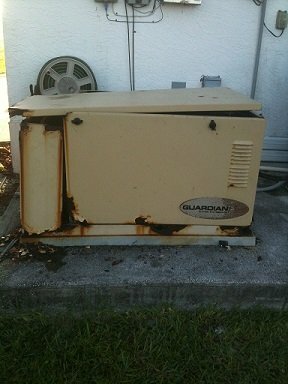 If you your standby generator is not running properly, or not running at all, you need to act right away. These units should not stay idle too long. Insects, rodents, and other animals will soon go inside your generator and cause additional damage as they make a home of it. This will undoubtedly cost hundreds of additional dollar to repair. We are experts at troubleshooting, repairing, and maintaining this type of equipment. We will make sure that when we are done, your unit is running according to manufacturer's specifications. There is nothing worse than having a generator fail to start when you need it the most. Generators are very robust machines, they can work for entire days and weeks at a time without complain, but if you don’t do proper maintenance, they will soon fail. Even if your machine appears to be running fine, if you have not done proper maintenance, it may be needing a tune-up and other adjustments right now. Click here to learn more about your Estero generator repair rates and fees. In coastal areas, where generators are exposed to humid salty air, their enclosures tend to wear out fast due to corrosion. Often the generator and engine are in good condition, but rust has destroyed most of the enclosure, chassis, and base. In these kinds of circumstances we recommend that you replace the enclosure rather than discard the entire generator. This is normally a costly repair, but it certainly cost less than replacing the entire generator set. If the corrosion has not done extensive damage to the enclosure and chassis, we may recommend to have them repainted. 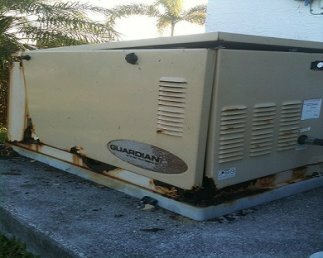 We have a painting program in which your generator is treated in such a way that it can be restored to a very acceptable condition and afford you many years of service. 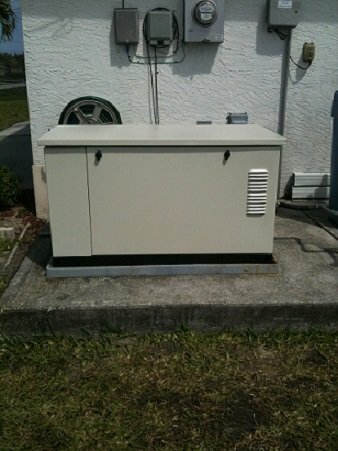 Contact us if your generator needs to be painted or have the enclosure replaced. A generator is not just another household appliance, but a scaled down version of an electrical power plant. It has complex control circuits, sensitive fuel requirements, and an array of sensors that monitor and protect the integrity of the unit itself and your home electrical system. Furthermore, the generator has a regular four cycle engine, and a large alternator that is made up by rotor/stator assembly. All these various parts and pieces of the energy producing system of a generator, are monitored and controlled by a micro controller usually called control board. For a generator to produce power, or even run at all, all the different components inside of it, must be working and calibrated to exact factory specifications. All these systems require regular inspection, maintenance, and testing to ensure that your generator is ready to work when you need it the most. It takes many years of training and schooling to become a seasoned and well trained generator technician. RCS Electrical Services takes pride in the structured hands on training it provides for each technician, and the factory training that we all receive in order to become certified on each of the systems that we service. Contact us with confidence anytime you need a Estero generator repair. Rotor and Stator assemblies are ones of the most challenging generator components to repair. Often times this requires to disassemble your entire generator, and remove everything but the engine. Later the rotor and stator needs to be installed, and the entire generator reassembled. Typically a generator that has a faulty rotor or stator assembly behaves in a very strange way, often cranking and running, later to shut down on faults such as RPM Sense Loss or Low Voltage. Generac generator repair maintenance and service. 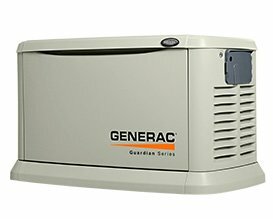 Generac generators are very robust machines. With consistent maintenance and care they will give you a long service life. A typical older Generac generator repair consists on minor things that are usually related to fuel pressure or sensor signal issues. Sometimes other parts may go bad. Electronic parts such as control boards are very reliable, but electro-mechanical parts such as relays and solenoids do not fair as well. RCS Electrical Services is well trained to repair, tune-up, and perform maintenance on your Generac generator. When is time to do your Estero generator repair, contact us. We are your expert Generac generator technicians. Kohler generator repair, maintenance and service. Kohler generators are known for their reliability and strength. A Kohler generator repair don't come to often if you are taking care of your generator and performing its yearly maintenance. One thing we have noticed through the years, is that sometime people turn off their Kohler generator to keep them from exercising. Often people think that by doing this they are saving money. The reality is that when you turn off a Kohler generator, and prevent it from doing its weekly exercise, all kinds of animals, including insects and rodents, can make a home out of your generator. These animals will chew on its electrical wiring, or make nests inside their control cabinets. The bottom line is that it is a very bad idea to turn off or idle a Kohler generator. The money that may save in fuel is minimal, but the repair expenses are going to mount. Although your Kohler generator is very robust and reliable, it does need regular service. If your Kohler generator is in need of service, repair or maintenance, click here to make a request for service or repair. You can also click here to learn more about our Kohler generator maintenance and repair program. Contact us when you are ready to do your Estero generator repair. Briggs and Stratton generator repair, maintenance and service. Briggs and Stratton has been a household name in the generator industry for many years. They have created a hardened version of their most sophisticated engines, and deployed them for generator use. The Vanguard series of generator engines are designed to offer a high degree of reliability, long service life, and endurance. As a result, these generators don't have a history of needing extensive repairs. With consistent maintenance and scheduled services, these units will give you many years of service. RCS Electrical Services has maintenance program that conforms to manufacturer's specifications for proper maintenance, repair and service of your Briggs and Stratton generator. General Electric generator repair, maintenance and service. General Electric has the most sophisticated standby generator in the industry today. They offer ample access to the generator and the control system. This allows the technician to conduct his maintenance and repair activities with ease and efficiency. General Electric generator repair can be kept to a minimum if generator service is done regularly. RCS Electrical Services recommends that generator service is done at least once a year. Sometimes generator service is not done regularly and a component of a generator may malfunction. The malfunctioning part, can then damage or destroy another part, which can become expensive. For example, when the battery is not serviced every year, it may dry out and fail. Often the battery charger notices that the battery is not retaining its charge, and puts more power into the battery, which can explode. When a battery explodes, it sprays battery acid inside the generator cabinet. This acid can eat away at sensitive winding inside the generator, which will now cost thousands of dollars to repair. This is just one example at what can occur when generator service is neglected.